My first time playing in an organized sport was also my last. I will never forget. We were called the Green Machines. It was a t-ball league. You know, the pseudo-baseball game where there is no pitcher. The ball just sat in front of you. Though somehow, very hard to hit. I hated it. I felt scared and inadequate. We only won one game that season. 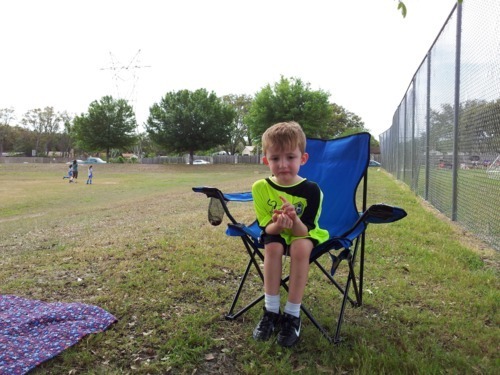 Ethan’s first soccer game was today. And it looked as though it started out like mine did. He was scared and timid and unsure of what he should be doing. But, he mustered up some courage, turned brave, and finished like a trooper. I think he just might like playing sports more than I did.